She's Fantastic: DC Bombshells - POISON IVY! This Poison Ivy action figure is the most risque of all the DC Bombshells designs. The Bettie Page-esque lingerie design wasn't my top look for the first line-up of action figures. But in person it's my absolute favorite. Her green skin and monochromatic undergarments make it a little less lurid than if she had a natural complexion. The vine tattoos are a great re-imagining of her typical plant motif. Pius the hair reminds me of Uma Thurman's design from the Batman & Robin movie. Let's check her out below! So DC Collectibles typically makes their modern figures using a tinted resin as opposed to painted plastic for the skin surfaces. This creates a soft natural color and a subtle lifelike translucency. In person it looks fantastic. The downside is that it photographs very tricky. If my camera is zoomed in, her skin tone looks pale green, but when zoomed out it appears to be a darker more saturated green. In reality, the true color is somewhere in between the two. Poison Ivy comes with four extra hands, a single rose, and a vine accessory. 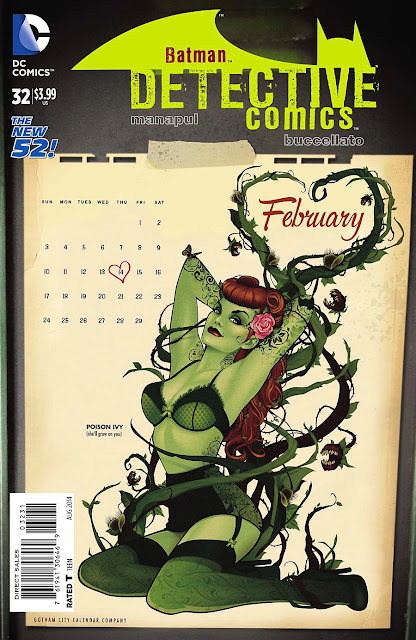 The Poison Ivy pinup design graced the variant cover of Detective Comics #32 in June 2014. Here is the original Poison Ivy Bombshell product, the DCC Statue from 2013. I would like to point out that the final production figure of Ivy looks a lot better that the solicit pics. For some reason the body looks way too skinny and stiff in this image. Plus the paint looks too bright and simplified. Here she is with the DC Direct Secret Origins figure and DC Collectibles New 52 Ivy. And with the TNBA and DC Superhero Girls figures. I love this series. I had no interest in the statues, but this figures are great, even if they had mad faces, specially WW. Poison Ivy is also my fave, followed by Batwoman, but I like them all. Can't wait for series two. I'm skipping wonder Woman just for the mad face haha. I think I will only be getting the bat-family characters in this line. Although it will be hard to resist Supergirl and Mera. Hi! I first wanted to say how much I love your blog! I think I could spend the next week alone just enjoying all of your wonderful posts! :D Thank you so much for all of your work at putting together such great reviews! Thanks for all the kind words! I spend a lot of time and effort working on this site on top of a full time job a schedule full of life commitments (and a slew of other hobbies). It's not uncommon for me to post a review at 4am (take the timestamp into account when my grammar is wonky.. i often go back and correct them the following day in embarrassment). Anyway, I love doing this and it's nice to be appreciated. It's even nicer when my enthusiasm over a toy can be infectious... because the more people that go out and buy them, the more figures that will get produced. And more than anything else in life, I just want more toys. This is probably the #1 figure a customizer would use to make a Betty Page figure. Skin, flsh... hair, black... BAM. Pinup girl to stand in front of some WW2 plane model lol. That would take a whole lot of painting! And it would be such a shame to cover up the details of the tattoos and stockings. There have been a few stiff Bettie Page figures in the past, but a classic, well-articulated one would be awesome. I really really want this figure. But i don't know about the material they used. I rather they used hard plastic. Is this a better option than the new 52 ivy? Her plastic is pretty rigid. I didn't mean to imply it was soft or weak. I think this figure is vastly superior to the New52 figure. That figure has stiff articulation and a blank look on her face. I still love having her in my collection, but If I had to chose one, it would be Bombshells all the way.